1. Reading the book of Proverbs is one of the most profitable uses of a Christian's time. A.	I have been reading a chapter of Proverbs each day for about 13 years. B.	I recommend that you do the same thing. C.	Proverbs has 31 chapters and most months have 30-31 days, so I recommend reading the chapter of Proverbs that corresponds to the day of the month everday. 2. The purpose of the book is to give the reader understanding, knowledge, wisdom, judgment, subtilty, and discretion (Pro 1:2-4). 3. It is written from a Father to a son (Solomon to his son, and God to us) (Pro 3:1; Pro 3:21; Pro 4:1; Pro 4:20; Pro 5:1; Pro 7:1). A. 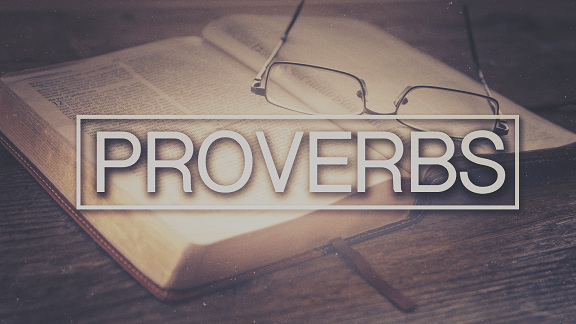 The first nine chapters of Proverbs exhort the reader of the necessity and benefits of getting wisdom. B. After making a thorough and compelling case for getting wisdom in the first third of the book, Solomon begins the actual proverbs in chapter 10 (Pro 10:1). 5. What is a proverb? A.	Proverb n. - 1. a. A short pithy saying in common and recognized use; a concise sentence, often metaphorical or alliterative in form, which is held to express some truth ascertained by experience or observation and familiar to all; an adage, a wise saw. B. In other words, a proverb is a short saying based on observation and experience. C.	A proverb by its nature is not necessarily a promise or an infallible decree from God. i.	Proverbs by definition are common sayings about things that generally and normally hold true, but all of them do not always hold true. ii. For example, Jesus Christ's ways always pleased the Lord (Joh 8:29), but His enemies were not always at peace with Him (Pro 16:7). D.	Usually, though, the wisdom contained in the Proverbs will hold true in life. i. The foremost theme in the book of Proverbs is to "get wisdom" (Pro 4:5; Pro 4:7: Pro 16:16), which is "the principal thing" (Pro 4:7). a. Wisdom n. - 1. a. Capacity of judging rightly in matters relating to life and conduct; soundness of judgement in the choice of means and ends; sometimes, less strictly, sound sense, esp. in practical affairs: opp. to folly. ii. Wisdom and its cognates wise, wiser, and wisely are used 125 times in the book of Proverbs. i. The book of Proverbs tells us to receive knowledge (Pro 8:10). ii. In order to judge rightly in matters relating to life and conduct, a man must first have the pertinent facts in his mind, which is knowledge. iii. Knowledge n. - II. Senses derived from the verb know, in its later uses. 5. a. The fact of knowing a thing, state, etc., or (in general sense) a person; acquaintance; familiarity gained by experience. 8. a. Acquaintance with a fact; perception, or certain information of, a fact or matter; state of being aware or informed; consciousness (of anything). iv. Knowledge and its cognates know, knoweth, knowest, and known are found 66 times in Proverbs. i. The book of Proverbs exhorts us to get understanding (Pro 4:5). ii. In order to have knowledge, a man must have the intellectual ability to perceive and acquire facts and reason with them, which is understanding. iii. Understanding n. - 1. a. (Without article.) Power or ability to understand; intellect, intelligence. b. of understanding, intelligent, capable of judging with knowledge. Similarly of some, of no, understanding. c. With the: The faculty of comprehending and reasoning; the intellect. iv. Understanding and its cognates understand and understandeth are used 66 times in the book of Proverbs. i. Putting it together, in order to be wise, which should be the ultimate goal of a Christian, a man must have the facts (knowledge), and the faculty of intellect, reason, and judgment (understanding), in order to consider the facts and apply correct thinking to judge rightly and choose the best means and ends in his life and conduct, which is wisdom. ii. God gives all three of these virtues to humble children of God who earnestly seek after them (Pro 2:1-6). i. Discretion n. - 1. The action of separating or distinguishing, or condition of being distinguished or disjunct; separation, disjunction, distinction. III. [Cf. discreet.] 6. Ability to discern or distinguish what is right, befitting, or advisable, esp. as regards one's own conduct or action; the quality of being discreet; discernment; prudence, sagacity, circumspection, sound judgement. ii. Discretion, which is found six times in Proverbs. iii. Our modern politically correct world vilifies judgment and discrimination. iv. But God's word magnifies and encourages it, with this caveat: "Judge not according to the appearance, but judge righteous judgment" (Joh 7:24). v.	To be able to have wisdom, we must know how to judge between right and wrong, and discriminate between good and bad. i.	Prudence n. - 1. Ability to discern the most suitable, politic, or profitable course of action, esp. as regards conduct; practical wisdom, discretion. ii. Prudence and its cognate prudent appear 13 times in Proverbs. i.	Foolishness n. - 1. The quality or condition of being foolish. ii. Foolish adj. - 1. Fool-like, wanting in sense or judgement. iii. Fool n. - I. 1. a. One deficient in judgement or sense, one who acts or behaves stupidly, a silly person, a simpleton. (In Biblical use applied to vicious or impious persons.) The word has in mod.Eng. a much stronger sense than it had at an earlier period; it has now an implication of insulting contempt which does not in the same degree belong to any of its synonyms, or to the derivative foolish. iv. These definitions make clear that he who exhibits the attribute of foolishness lacks judgment, acts stupidly, and is worthy of contempt. v.	Foolishness and its cognates fool and fools are used a 84 times in Proverbs. i. Folly n. - 1. a. The quality or state of being foolish or deficient in understanding; want of good sense, weakness or derangement of mind; also, unwise conduct. ii. Folly is used 13 times in Proverbs.